Throw a splash of color on your drinks and desserts with these Regal 16 oz. light blue maraschino cherries with stems! Featuring a vibrant light blue color, these unique cherries are sure to brighten up your menu items and bring something new to the table. There are plenty for you to use to match the color scheme of your next holiday display or special event. Thanks to Regal Foods, you'll be sure to get the brilliant color and sweet cherry taste you're looking for at a great value! "I love that these aren't your traditional red cherries!!! They are perfect for ice cream sundays. These are very popular during our kids birthday parties"
These light blue cherries are particularly useful for topping colorful creations like jello shots, frozen yogurt, and frosted cupcakes. They even come with the stem to provide a more natural look, while also making it easy for patrons to pluck their sweet treat from atop their cocktail or banana split. 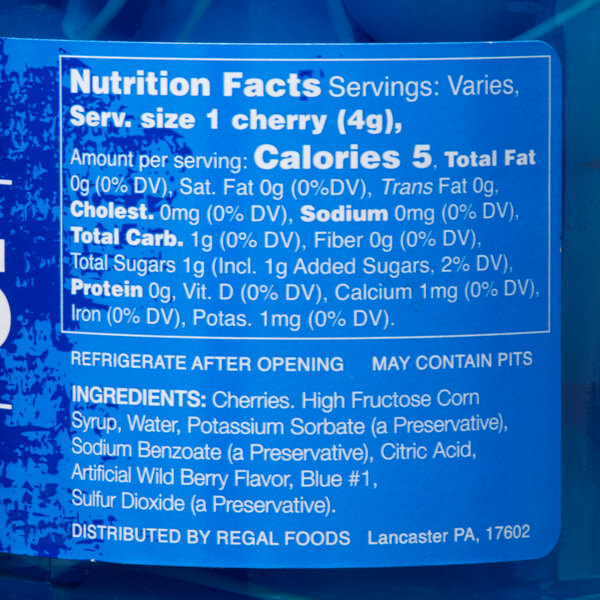 Preserved and sweetened, these maraschino cherries are ready to use right out of the container. They make an excellent decorative drink garnish for a variety of cocktails, including amaretto sours, tom collins, and manhattans. You can even add them to shirley temples for a pop of color that guests of all ages can enjoy. These cherries boasts a crisp, wildberry flavor and soft texture, making them a must-have topping for your restaurant, bar, ice cream shop, or bakery. Your guests will love the punch of color and flavor these cherries bring to the table! 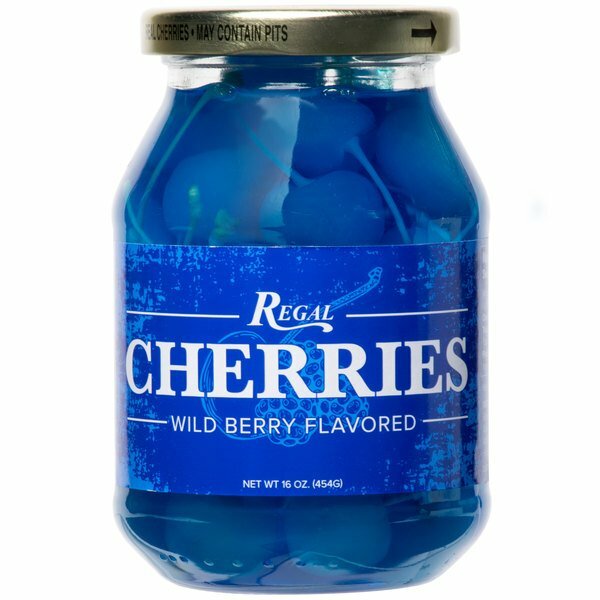 Always a hit when we make a product with these blue cherries in our store. Something you don't see everywhere and always gets children excited. 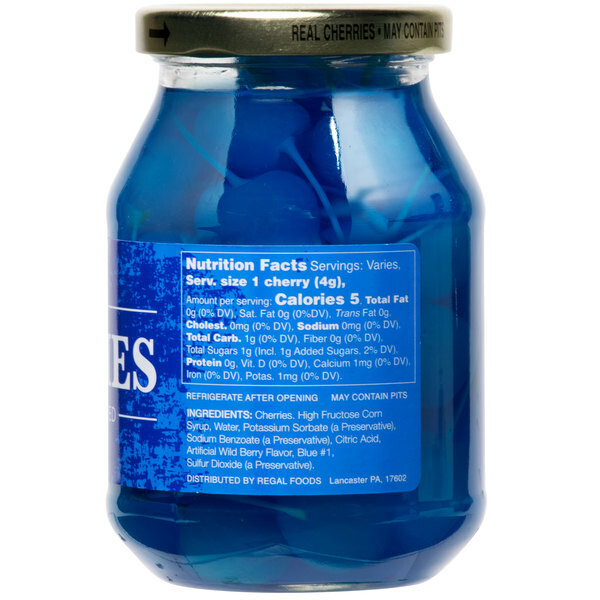 This whole line of Maraschino Cherries are good, we use them in tradition cocktails, and also as a garnish on other drinks, These blue ones work great in sour mixes and have a bright color that lasts. 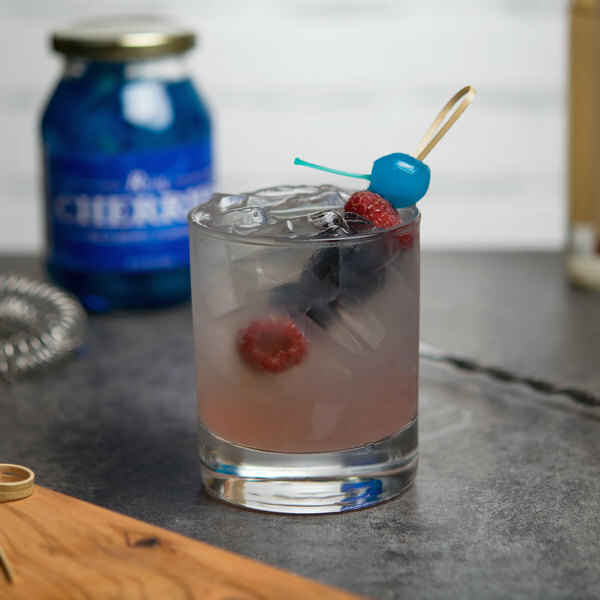 These Light Blue Cherries hold their color and make our drinks look great. The color of these light blue maraschino cherries in person are just as vibrant as they are in the picture. Very eye catching. Taste great too. These cherries, though more expensive that red ones in bulk, are a huge hit in specialty cocktails as well as mocktails. I do wish that they were a bit plumber, but the color makes up for it. The light blue maraschino cherries add a splash of color to any cocktail or dessert. The blue color is unique and jazzes up any party cocktails or desserts. Guests will be awed by these cherries. The light blue maraschino cherries with stems are super cute and a great garnishing agent for our cotton candy cupcakes. Love the color and so do our customers. These light blue maraschino cherries have a great flavor and the unique color make them a hit at our bar for garnishing drinks. I love their vibrant color. These are so much fun! The taste is pretty good but it’s more of a wow factor when you throw them in your sinks for guests. A stunning quality light blue maraschino cherries with stems that make a great addition to our daiquiris. The customers are amazed by the color and we love that. These were hard to find but super pleased with the quality. These Regal Light blue Maraschino Cherries are so pretty they taste like normal Maraschino cherries but they sure do draw attention. I used them to make a Fruit salad and it was so pretty. Regal 16 oz. light blue maraschino cherries with stems. These are wild berry flavored. The added flavor is not bad at all. I like this flavoring. Wow! I did not realize they made different color maraschino cherries, but these are so cool. 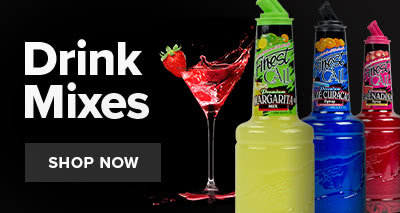 They are great for making specialty cocktails and the blue cherries really pop. A great quality and tasty cherry as well. These wild berry flavored cherries taste kind of odd. I got them to add to drinks for our bar, and everyone thought they were super awesome. It's something different that people haven't seen, except the flavoring isn't the best. At our restaurant a very popular drink with the kids is our Shirley temple. Using about 2 different colored cherries in each drink puts the biggest smile on their faces when they see it!